If you were of the opinion that cross-platform or Web apps are not as competent as their native counterparts regarding delivering performance and user experience (UX) are, we guarantee that once you reach the end of this post, you will have a different mindset. Recently, on November 1, 2017, Google released the fifth version of Angular. What’s new in Angular 5.0? Or how would they help with creating high-performance apps with a great user experience? Find your answers below. Angular compiler now works as a TypeScript transform. With enhancement pursued with its compiler, Angular 5 is all set to favor incremental compilation. This helps with creating faster rebuilds, especially for production builds and builds with AOT. In-built Decorators now help with shipping smaller bundles by removing whitespace. More loading time means more user dissatisfaction which, in turn, translates into higher app abandonment, and more dissatisfied customers or poor productivity. AngularJS 5 paves the way for the development of Progressive Web Apps. Wondering what are Progressive Web Apps? Well, apps that can leverage the browser cache. Recall how browser cache helps repeat web visitors to access information from a website in a quick and easy manner. Now, app users will also have the advantage of the same. Nobody likes a sluggish web or mobile apps. In fact, poor performance is one of the key reasons behind bounce and app abandonment rates. Setting up a new benchmark for performance, AngularJS 5 revamps its RAIL model (The acronym stands for Response, Animation, Idle, and Load) that aims at making an app more responsive towards the user’s actions. In its developer’s guidelines, Google emphasizes on making the user-interface works faster. It expects that users should be acknowledged in under 100ms. If there is some animation or scrolling, the resultant frame must appear in 10ms. For the delivery of interactive content, it sets a time-cap of 1000ms. Wondering what new features does AngularJS 5 have it to make this happen? Well, the latest edition has got Build Optimizer to perform the job. Interestingly, an AngularJS development company doesn’t have to do much as the tool comes into effect by default, and it reduces the size of the created app-build by scrapping out unnecessary code as we have mentioned in one of our previous blogs. Introducing StaticInjector in place of ReflectiveInjector, Google makes it easier for AngularJS developers to cut down the application size. Digital experience is a craft, and Material Design is a holistic framework packed with theory, resources and tools that provide the guidance required to make the craft tangible. 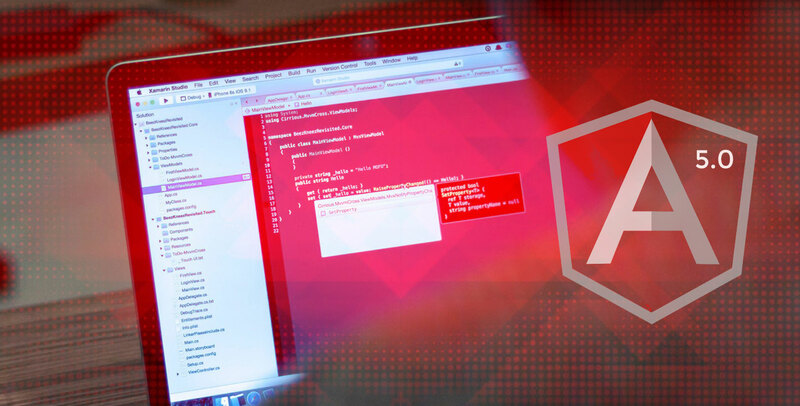 AngularJS 5 is to make Material Design components compatible with server-side rendering. Beyond doubt, this is no less than a reward for the UI-UX designers. The attempt by Google will help in improving the visual language that users understand the best irrespective of their ages. If you are an AngularJS developer, hold your breath as Google is yet in the process of eliminating a few bugs before releasing this functionality. Angular 5.0 release is an opportunity for businesses and startups to reinvent their digital user experience (UX). Extra attention is required while migrating an app created with Angular, i.e. 2 and 4. The intricacies stand with updating Angular CLI. Hence, to make the technology investment work, you should approach a mobile app development company with hands-on experience in Angular. July 30 2018Why AngularJs Is Exalted by Fortune 50 for Web Development?